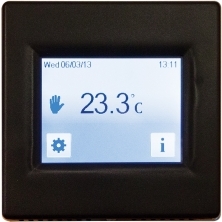 Our latest full colour touch screen thermostats can switch loads of up to 3.6kW and provide ultra-simple 7-day programming. Available with choices of white, silver or black surrounds, the T16C can be configured for “air and floor” or “floor only” control. When required the air temperature can be controlled via an IP65 rated remote mounted wall-sensor (T16R). This arrangement is particularly well suited for bathroom applications. The T16C also allows the user to monitor energy usage and running costs.